Although Google has made multiple announcements over the years, it still caught many people unaware: starting summer of 2018, many previously functioning Google Maps applications now showed a popup message that says “This page can’t load Google Maps correctly,” and a Google Maps background that displayed the text “for development purposes only” throughout. 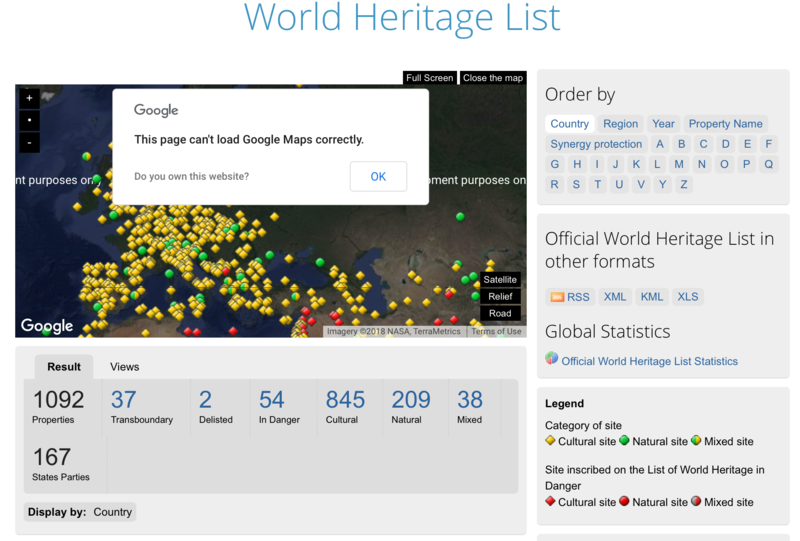 As of November 2018, you can see an example of this at the UNESCO World Heritage Centre’s mapped list of sites, the World Heritage List. The simple method of implementing a map—keyless access—was no longer supported. All new applications have to use an API key. A limit of 25,000 free map loads per day was established. Over that, a $.50 per 1,000 additional map loads fee was imposed, up to a 100,000 daily limit, before users needed to move to the Premium plan. Starting June 2018, Google tracks and cost accounts for every use of the map API; a helpful $200/monthly credit from Google should cover most low-usage cases, such as a map on a marketing/communications website contact page. A useful pricing calculator helps customers establish a baseline cost. Google replaced the previously free 25,000 map loads per day with a roughly 28,000 maps loads per month, for about $200. 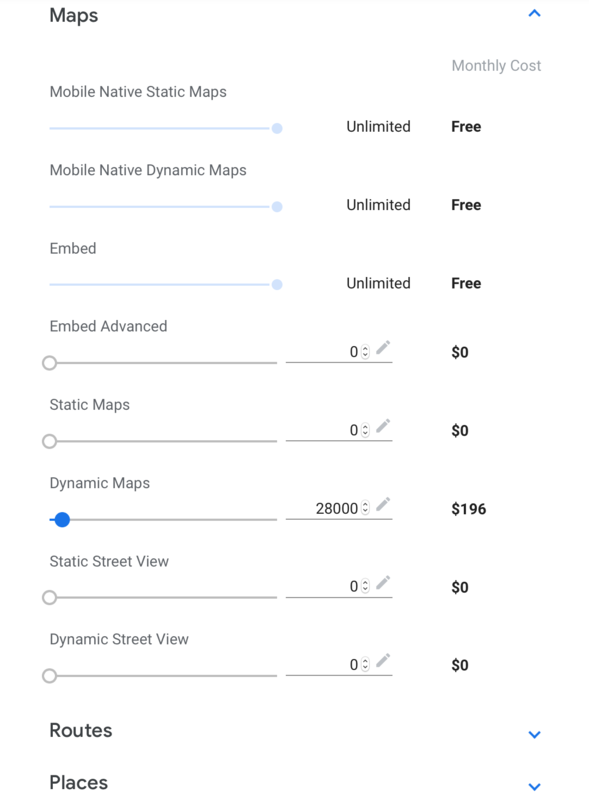 However, basic embedded maps remain free; Advanced Maps embed use directions, street view, or search, billed based on these rates—$.014 USD for each map load up to 100,000 a month, 0.112 to 500,000. How can I manage runaway costs? The new Google Maps Platform offers budget alerts; they can be configured to send notifications based on a threshold. Users can also cap API usage in a variety of ways, including requests per day, per seconds, or per user. Even Google refers to the $200 credit per account as a “free courtesy usage limit,” and there are no promises that this monthly credit will remain in the future. There are alternatives: OpenStreetMap is a community-driven, open data platform that is free to use for any purpose, given appropriate credit, and may be sufficient for many uses. What alternatives have you considered? Do the rich features of the Google Maps Platform justify the cost? Feel free to leave me a note below with your questions and experiences.